Since Directors Notes opened its doors in 2006 many filmmakers have come (and some have unfortunately gone), but one who has remained creatively constant through the years is Spanish animator Jossie Malis, whose long running shadow theatre inspired series Bendito Machine has provided a universally accessible commentary on mankind’s complicated relationship with technology and one another – it also features some of the coolest machines ever animated! 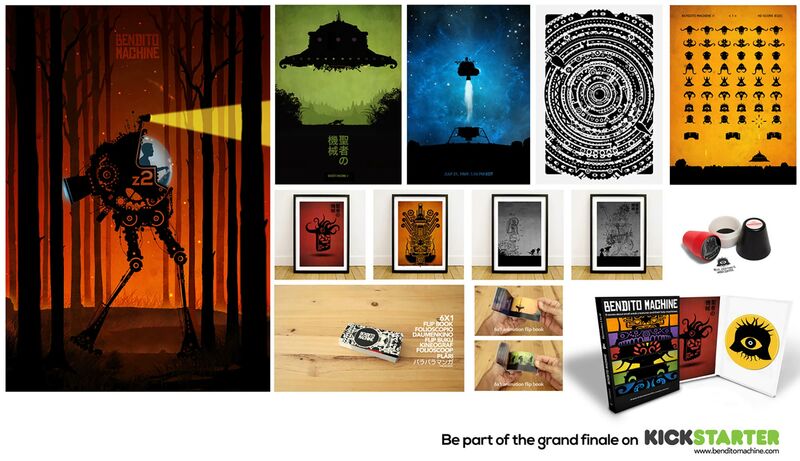 Not that I’m at all happy about it, but as they say all good things must come to an end, although in this instance you can alleviate that pain by knowing you were part of the Kickstarter campaign for the series’ grand finale. Jossie was kind enough to take some time out of the final Bendito Machine crowdfunding push to reflect on the series’ decade long legacy and share what Holy Gifts are available for backers of this final instalment. Back in 2008 we discussed your love of stop motion animation and the difficulties of getting those types of projects off the ground. Have you been able to pursue any stop motion projects since then? That’s right. I’ve spent the last years working on other several projects, from 2D animation, art direction for video games, VR, design and illustration. My next animated project, after finishing the Bendito saga, is a science fiction short film that will integrate some different animation techniques and stop motion as well. I’ve been working on that script for the last 5 years now from time to time, but I decided to make a break in order to finish Bendito first, I think I need to close doors to keep moving forward, otherwise it would be frustrating. The dialogue-free nature of Bendito Machine is one of the series’ great strengths, yet has never prevented you from commenting on complex societal issues. How do you break down your themes to be universally understandable but in no way dumbed down? I spend a lot of time working on the storyline. Also, during production, I used to make all kind of changes depending on how the story evolved. We are a very small team, so we have plenty of time and flexibility to find out if we like what we are doing at some point or if we need to redo some sequences to fit better in the story. The issues in my films are mostly related to universal conflicts everybody can recognize, it’s happening everywhere, and because it is dialogue-free, you don’t need to understand any language, just follow the visuals, like watching an ant colony doing their stuff. It’s easy to digest. I usually try to breakdown the stories in a way that you never have a chance to know how everything ends, actually, it is at the end of each episode when the stories go really dumb and twisted for me. Originally you envisaged 10 episodes for the series, what prompted the shorter run? Actually, I wrote down the arguments for 12 episodes many years ago. The first Bendito Machine came out in 2006 as a small and humble experiment for me, I was learning to animate in Flash at that time but I never had a plan for it. I just made it for a Flash animation festival to give it a try, and the response was amazing. Then I started thinking about the idea for a series, but it was very frustrating to try to do it in a conventional way, in an industrial way. I always wanted to do it in my spare time, without expectations of any kind, and I didn’t want them to grow as a TV show or anything like that. I received plenty of offers to make it, and tried to reach some deals that looked very interesting at that time, but in the end everything deflates. So I kept doing the episodes in my own way, at home, avoiding the burden of the animation industry that was never appealing for me. Now the series is like a little 10 year old boy, still young, but for me, ready to leave home. That’s why I decided to finish the series and keep moving with different projects now. Now the series is like a little 10 year old boy, still young, but for me, ready to leave home. How has your approach to the production of the episodes developed over the past decade? The approach is almost the same. In terms of production, we have much more experience in animation, storytelling, music and design. Six years ago I got married to Julie, who is a wonderful music composer and producer, she has been working on Bendito since episode 4, the rest of the team is Pau Martinez, an animator and good friend who has been working with me for 10 years now. So now we are 3 people and Momo, a lazy cat who loves to annoy us when he wakes up. I’m a proud owner of a Bendito Machine t-shirt, badges and stickers (still waiting to be stuck on something worthy) from your last Kickstarter campaign. What rewards can I add to my collection this time round? This time we have developed really wonderful rewards. I’m a Flip Book lover, so thanks to the help of an animator colleague in Portugal, we have created an amazing flip book with 6 animated sequences in one, it’s like a magical device. It’s funny to see people’s faces when they try it. We’ve also developed several posters designs, around 12 now and are expecting to do a couple more. Some of them are personalized, so you can send us a picture of your profile and you’ll get a unique high quality poster exclusively for you, it’s a unique piece. The same with the flip books, we offer the possibility to create your own animated flip book with 2 different animations starring you. Also, we are finally developing an exclusive DVD edition box with the whole series and extra material, plus a set of postcards inside the box. This edition will be published by Cameo, one of the leading DVD distribution companies in Europe. We have many different choices for all pockets, for €5 you’ll be included in the credits and receive an early access to a private streaming video of the finished film, and for €500 you’ll get almost everything and our eternal love. We have 3 days to reach our goal now, so we encourage all the Bendito friends to take a look at our campaign.